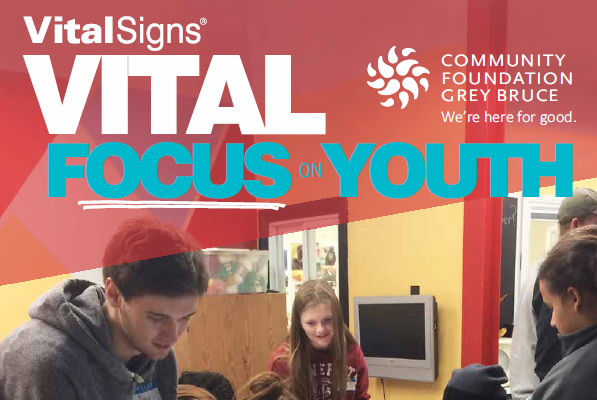 Vital Signs is a community check-up that measures vitality, identifies significant trends and supports action on issues that are critical to our quality of life. Our report contains important data on six topics related to life in Grey Bruce: health and wellness, the environment, living standards, arts and culture, education, and community connections. Our aim is that this Vital Signs report will be an agenda-setting tool—a list of priorities for our community to consider in the coming years. The report will not only assist the Foundation in establishing granting priorities, but will also aid work by local agencies. We hope a successful Vital Signs report will also generate discussion, forge new partnerships towards collective impact, and ultimately result in a healthier community and a better quality of life for all. This report is part of a nation-wide movement where numerous Community Foundations from across Canada release their individual Vital Signs reports during the month of October. These launches will coincide with a new national report from our umbrella organization, Community Foundations of Canada, that will explore the impact of social participation on our sense of belonging to a community. Visit the recently updated Vital Signs website at www.vitalsignscanada.ca to read reports from other regions. Our Vital Signs report paints a picture of the quality of life people experience in Grey and Bruce counties. From the vibrant cultural scene to the awe-inspiring natural beauty of our landscape, there are many positive things to report on. Of course, there are challenges that emerge from the data, particularly around employment and the lack of opportunities for youth. We also are challenged by living in a large rural area that has no regional transportation system. Our population is older than the Ontario average. The benefit is that seniors are terrific volunteers and supporters. Many of our constituents struggle with low incomes, high rents and precarious work situations. Everyone needs to reach out to look after one another, lending a hand to those less fortunate. Another emerging challenge relates to the lack of diversity in our communities. While there is evidence that this is changing and newcomers are moving to Grey Bruce, we need to create an environment of inclusion and provide services and support for new Canadians as they take up residence here. Grey Bruce acknowledges that we should celebrate the culture of all our peoples including building stronger relationships with the First Nations that reside within our region. Community Foundation Grey Bruce hopes that you will take the time to read this report and to think about how you be part of the movement towards a better community where everyone prospers. Make a donation to one of our funds that support the good work that charities and non-profits are doing every day to make our home a better place. Watch for forthcoming news on how you can participate in the ongoing Vital Conversations about life in Grey Bruce.